The H.N. White Company’s saxophone’s are legendary. Once Mr. White began producing his own saxophones in 1916, the King name soon became established as one of America’s premier saxophone brands. The following ads are just a small sampling of some of the horns that made H.N. 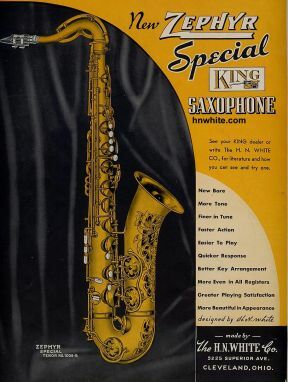 White King saxophones, one of America’s classic saxophones. For more vintage H.N. White King saxophone ads, check out hnwhite.com.